Whether boiled, grilled or steamed, Americans consume more shrimp each year than any other type of seafood. The National Fisheries Institute calls shrimp both healthy and tasty, as the seafood contains a mere 83 calories, 18 g of protein and only 1 g of fat in a 3-oz. serving. Boiled shrimp is commonly served as the classic restaurant appetizer shrimp cocktail, although Southerners also include shrimp in their traditional seafood boils. With a little time and the right materials, you will be boiling up shrimp for your next dinner or event. Fill a stockpot with water and 3 tbsp. kosher or sea salt. Place the shrimp into the boiling water. Re-cover the pot, reduce the heat to medium and let the water come back to a slow boil. Cook the shrimp until they turn bright pink and become opaque. This may take anywhere from three to eight minutes, depending on the size of the shrimp. Plunge the shrimp into a large bowl filled with ice and water to stop the cooking process if you are not serving them immediately. Do not allow the shrimp to sit in the cooking liquid or they will become tough. Remove the shrimp from the ice water when they have begun to cool and set them in a colander to dry or pat them dry with paper towels. Spice up your shrimp by adding seasonings to the water. Celebrity chef Emeril Lagasse’s favorite recipe includes boiling the shrimp in water containing coriander, lemon, white wine, bay leaves, cayenne pepper and a variety of fresh herbs. 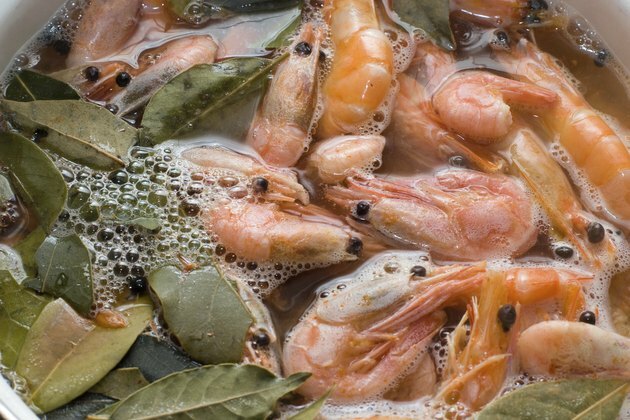 The U.S. Food and Drug Administration cautions that shrimp should be properly cooked before being consumed to avoid any potential foodborne illnesses. Make sure that the shrimp is thoroughly pearly-opaque or has reached an internal temperature of 145 degrees Fahrenheit before enjoying it.